This entry was posted on November 27, 2008 by Andy. The Volta Oil Lamp from Zack is great for creating romantic mood lighting this Christmas (or any other time of year for that matter)! And as it's an oil lamp you even get to save on electricity! We think that they look great as a pair at each end of a mantelpiece or maybe on a couple of side tables or it would look equally as good as a table centrepiece. 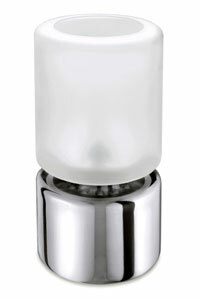 It has an opaque glass funnel to diffuse the light and a polished 18/10 high grade stainless steel base. It would even make a great gift as it comes in a sturdy and attractive gift box. What's even better is that Proleno is currently offering this lamp with a great discount!